Half round rings are jump rings that are rounded on the outer surface, and flat on the inside. They are truly half of a ring. 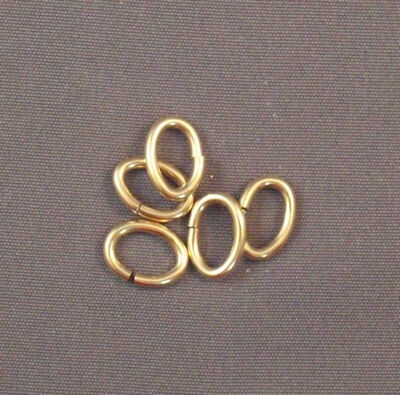 Half round rings have limited usage in specific weaves such as the French Rope chain. These rings are made of 14/20kt Yellow Gold Filled Wire. This means that the wire is made of a tube of yellow gold and it is filled with a metal alloy. The 14/20kt means that the outer 5 percent (the hollow tube) of the ring is 14kt gold. I like to use yellow gold filled because it has the look and feel of 14kt gold without the cost of pure 14kt. I have never had the gold wear off as gold plated and vermeil sometimes does.